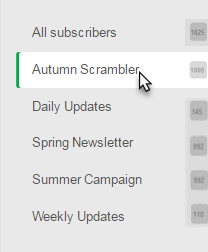 Click the Subscribers tab at the top of the page. In the left pane, choose a mailing list that contains the contacts you want to send a campaign to. Check the Email box at the top of the list to select the first 30 contacts shown on the current page. After selecting those contacts, you're given an option to select all in the list. If applicable, select all. To hand-pick individual contacts, you can manually check the boxes next to contact names in the list.